Owen Sound Southern Ontario, Canada is located at the bottom of the Bruce Peninsula. Locator Internet Services Summer Prospective! 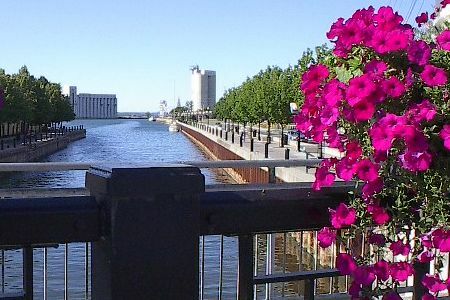 Up front we tell you that Owen Sound is not known for tourism but for business and commerce. In the past 10 years the city has been making great strides to improve this image. The long weekends have lots of activities and other weekends usually have something going on at Kelso Beach or Harrison Park. The reason I would pick Owen Sound as a tourist spot, is its location at the bottom of the Bruce Peninsula and it proximity to all the attractions. Ontario Summers are diverse in weather. We could get a few days of unbearable heat or a few days of gorgeous weather or a few cool days. This repeats over the entire summer. That is why the Owen Sound location is important. You can get to everywhere in Grey and Bruce Counties quickly. It's too hot what should we do? Lets go swimming...where? ..Sauble Beach 15min, Hibo 5min, Wasaga Beach 1 hour or one of the many small beaches.......lets go to the small beach across from the Owen Sound Golf Coarse 5 min ...... it is a great spot for a picnic too. It's a gorgeous day what shall we do? Do you want to go? ... golfing ...windsurfing ... hike the Bruce Trail ... you know Owen Sound has some of the best lookouts at Inglis Falls, West Rocks and Springmount ... we could rent a charter and go salmon fishing or get our poles and go into the rivers looking for that allusive brown trout ... if we do that lets take lots of bug repellant ... we could take the kids to Harrison Park and rent a boat and get some food ... well what do you want to do? ... we could go shopping ... take in a little theater performance ... suntan at the beach ... there is a craft show going on this weekend ... how about a nice walk along the improved shoreline to Kelso Beach? ... well what do you think? ... I think we have a problem. It's cool and miserable and looks like rain. What shall we do? We could do your shopping today or drive to Toronto for a Blue Jays game (2.5 hour + traffic) ... there are some excellent mountain bike trails in the area ... we could do that fishing trip today ... also I hear the drive along the Georgian Bay shore to Tobermory (the tub) is gorgeous with lots of Niagara Escarpment views ... what would you like to do? ... you know that most towns in Grey Bruce are within 1 hour of Owen Sound and there are some very unique shops ... and if this weather keeps up Barrie, Brampton, Guelph and Kitchener are all just two hours away ... what do you think about doing that? ... I think the weather better break before my bankbook does. What we have tried to do is show how quickly you can get around Grey-Bruce from Owen Sound. Also you will find that we have great Hotels and Motels, B&B and Camping Facilities within the city limits. We are known as the Scenic City.